Shop for Fedora Linux software. Fedora (previously known as "Fedora Core") is a version of Linux whose developed is sponsored by Red Hat Inc., and intended to replace those versions of Red Hat Linux which were previously aimed at home users. 64GB MultiBoot 32IN-1 USB Drive - Includes Ubuntu 18.04, Linux Mint 19.1 Cinnamon KDE Mate Xfce, Zorin OS Core 12.4, Manjaro 18.3, Fedora Workstation 29, Arch Linux - Support 32-Bit & 64-Bit Hardware! New 64GB MultiBoot Linux USB Flash Drive with the Latest Versions of Ubuntu, Linux Mint, Zorin OS, Manjaro, Arch Linux, Fedora and Many More! Perfect Windows OS Replacement - This Linux on USB Drive is specially produced by OS System Tools, so ensure you buy it from OS System Tools for full product support. Try Linux: Live OS with full install options. Linux is a community developed operating system that is perfect for laptops, desktops and servers. Whether you use it at home, at school or at work Linux contains all the applications you'll ever need. Try Linux on 64GB USB Flash Drive - Live OS with Full Install Options. Parted Magic Live OS Included! - Parted Magic is one of the best standalone partition management Linux solutions out there. 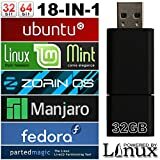 32GB MultiBoot 18-IN-1 USB Drive - Includes Ubuntu 16.04, Linux Mint 18.2 Cinnamon KDE Mate Xfce, Zorin OS Core 12.1, Manjaro 17.2, Fedora Workstation 26 - Support 32-Bit & 64-Bit Hardware! Perfect Windows OS Replacement - This Linux on USB Drive is specially produced by ACLLC Technology Service, so ensure you buy it from ACLLC for full product support. Enjoy the simplicity of Linux OS's intuitive interface. Fast, secure and with thousands of apps to choose from - for everything you want to do, Linux has what you need. 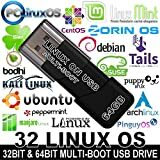 Try Linux on 32GB USB Flash Drive - Live OS with Full Install Options. Ultimate Partition Manager - Powerful hard disk partitioning tool. Partition can create, copy and resize primary and extended partitions.